PETALING JAYA: Despite the unending controversies that have beleaguered Eastern & Oriental Bhd (E&O) since last year, the niche property developer is forging ahead with its next flagship development in Iskandar Malaysia. The Penang-based company is looking southwards to Johor's new growth region to build a wellness-themed township called Medini Integrated Wellness Capital. Deputy managing director Eric Chan told StarBiz that the project, which is still in its early stages, could be launched as early as next year. The Wellness Capital, with a gross development value of RM3bil, will occupy 210 acres in Medini, one of the clusters in Iskandar. The land was bought for RM350mil in mid-2011. 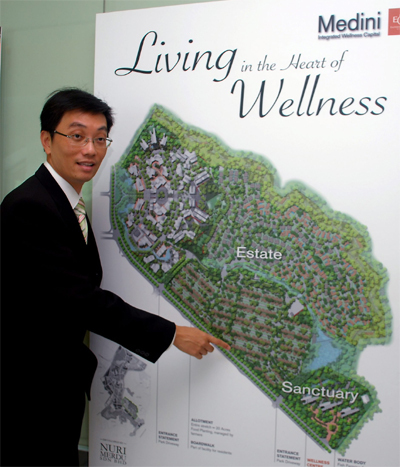 Chan said this would be E&O's maiden foray into Johor, and the first of its kind wellness-based township in the region. “We believe the market is moving in this direction,” he said of the rationale for the focus on wellness, adding that the idea was first mooted by Khazanah Nasional Bhd. According to Chan, this was not an entirely new concept as there have been similar developments in Canada and other countries. The project will be undertaken by Nuri Merdu Sdn Bhd, which is a 50:50 joint-venture (JV) between Galaxy Prestige Sdn Bhd, a wholly-owned subsidiary of E&O, and Pulau Indah Ventures Sdn Bhd. Pulau Indah Ventures is a 50:50 JV between Teluk Rubiah Ventures Sdn Bhd, a wholly-owned subsidiary of Khazanah Nasional, and Aneto Investments Pte Ltd, an indirect wholly-owned subsidiary of Temasek Holdings (Pte) Ltd.
E&O is responsible for the overall project management as well as sales and marketing. As its partners are the sovereign wealth funds of both Malaysia and Singapore, a working model of the project was presented to the respective countries' Prime Ministers during their leaders retreat in Putrajaya in January. The Wellness Capital will comprise two main portions the Medini Estate, which is the overall development, and the Medini Sanctuary, its 12.5 acre core. The township is fringed by a natural mangrove forest. Chan said an operator would be brought in to run the Sanctuary by the end of the year. “It is too early to throw out their names. We have not identified anyone yet but a few names have come forward. We will do the rounds to visit their facilities after Chinese New Year. “Of course, Khanazah and Temasek can use their network to help us get the best team on board,” he said. He added that the residential side would comprise 96 bungalows, 68 semi-detached homes, 445 terrace houses, 1,415 condominium units and one block of serviced apartments. Some 18 acres have been earmarked for commercial property. However, this was a work-in-progress and the final numbers were subject to change, he pointed out. In keeping with the wellness theme, Chan said the township might allocate 20 acres for food planting and fish farming. On its target customers, Chan explained that they would be locals and foreigners above 40 years of age and from the middle-income group. “Why 40 and above? Because they have typically acquired some capital by that age and can understand the need to spend money to prolong one's quality and active years,” he said. He stressed that the development would not cater specifically for the “super-rich” and would be affordable to regular wage-earners. In terms of returns, Chan said the development was expected to generate a 20% to 25% profit margin in two or three years, similar to E&O's previous projects, and begin contributing to earnings two years after its launch. 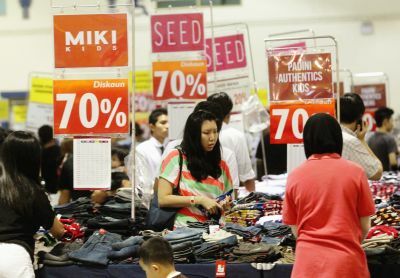 PETALING JAYA: The Asian retail property sector is expected to remain bullish this year with eager international retailers seeking expansion in Asia, lured by the region's growing wealth and tourism potential. In the biannual Asian Property Outlook and Strategy report, real estate investment house Pacific Star noted that Asian governments had been focusing on developing domestic demand from a structural perspective, which should bode well for the retail sector. “The long-term Asian consumption story remains as strong as ever. While we have seen the short-term outlook affected by the uncertainties in the global economy, the growth potential for the region remains. “This is evident in the comments made by global fashion groups with regards to their expansion plans and the growth in earnings from the region,” said Pacific Star research and strategic planning vice president Lam Chern Woon in a statement recently. He expects this trend to continue and with it, the demand for innovative retail properties to meet the appetite of the growing Asian consumer. Pacific Star continues to rate the retail property markets in Singapore, Hong Kong, Kuala Lumpur as Tier 1, given healthy labour market conditions, strong tourism throughput and interest from international retailers. Markets classified as Tier 1 merit serious investment consideration over the coming six to 12 months, while Tier 2 markets are generally attractive although the risks could be considerably higher due to macroeconomic or supply issues. “While economic uncertainties will exert downward pressure on prime rents in the near term, the correction is expected to be limited, given the favourable supply outlook and buoyant domestic spending in these markets. “Retail spending has also held up in Asia due to tight labour market conditions and a buoyant tourism sector,” he said. He said consumers in this part of the world continue to be more optimistic than their counterparts in the United States and Europe as a result of healthy employment. While the office sector is expected to be impacted by hiring headwinds due to the fallout from the European debt crisis, the group still rates the Singapore office market as Tier 1 for its attractiveness. “Pre-commitments have been healthy and the city state remains highly favoured as a global and regional business hub due to its political stability and pro-business environment. “The cyclical nature of the Singapore office market suggests that it could also recover quickly when global conditions turn around,” he said. On the Malaysian perspective, the group said the office leasing market in Kuala Lumpur was relatively stable with net absorption improving in the second half of 2011, with relatively healthy economy growth this year expected to support office demand. However, it said rentals would likely remain soft in the near term with supply outpacing demand, and capital values were expected to remain stable as owners were not under pressure to lower their price expectations. “Over the medium term, we are cautiously optimistic that governmental initiatives to attract multinational corporations to set up their regional headquarters in Kuala Lumpur will help absorb the new supply and support the office market,” he said. Meanwhile on the residential front, the group expects policy tightening to tail off where in most Asian residential markets, the effects of earlier property cooling measures have begun to adversely impact sales. “This has translated into lower home prices in Hong Kong and some Chinese cities. “Mortgage rates across Asia have also started to creep up over the past few months with a detrimental impact on housing affordability,” he said. GRIK (PERAK): Emkay Group, controlled by property magnate Tan Sri Mustapha Kamal Abu Bakar, expects its Belum Rainforest Resort (BRR) in Pulau Banding to be a profit churner for the group in the future. The BRR project, which is currently being developed, is expected to be fully completed within the next 10 to 15 years. "This place would be the next profit centre for us in the future," said Mustapha Kamal, who is the group chairman. The overall development of BRR involves four phases on over 600ha in Malaysia's 130 million-year-old Belum-Temengor rainforest and will boast a gross development value (GDV) of RM639 million. Emkay has so far completed the first phase in June 2009, while the second phase is under progress and expected to be completed in March next year. Mustapha Kamal, who founded Emkay Group, said the group has invested about RM100 million for the two phases. The first phase of the BRR project was built specifically to attract foreign visitors, while the second phase is aimed at attracting more local visitors, he told a news conference last Wednesday. The Emkay group has allocated some RM29 million for the development of the second phase. Under the second phase of development, the resort will have a total of 113 rooms, including six kampung-style houses, and new facilities like spa rooms and swimming pool to cater to the growing number of visitors. The domestic construction sector is expected to perform better this year with large infrastructure projects and housing construction activities expected to underpin growth. 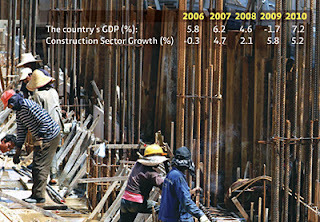 Industry observers said builders would welcome the Year of the Dragon with open arms knowing that the sector is likely to perk up after the impending elections at the end of the first quarter of this year. In the last budget announcement, the government has made known of its intention to boost the construction sector's growth by seven per cent to drive the national economy this year. It is an ambitious target, especially when the Malaysian construction industry is set to grow by a bullish RM92 billion this year from RM85 billion last year. Growth declined for the most part of 2011, expanding by only three per cent in the third quarter of as most large scale projects mooted by the government were deferred. "This (the slowdown in 2011) is attributable to the slower-than-expected rollout of projects. New domestic contracts in the first nine months of 2011 only amounted to RM49.4 billion, which is only 58 per cent of 2010's full year total of RM85.2 billion and 2007 to 2010 average of RM84.7 billion," said Malaysian Rating Corp Bhd (MARC) vice president of ratings Rajan Paramesran. This, he said, was unlike 2010 which was boosted by the announcement on the Economic Transformation Programme (ETP) and led the construction sector to rebound to 5.6 per cent. However, the industry is expected to see a fourth quarter boost in construction activities as seen in previous years to elevate the full-year industry growth to around four per cent in 2011. Hence, economists believe that timely awards and implementation of projects as per the 10th Malaysia Plan (10MP) and the ETP from now will contribute positively to the growth in 2012 as the projects require gestation period in order to generate impact to the economy. According to Rajan, various packages for the construction of the Greater KL Mass Rail Transit (MRT) line project that have already been tendered out will contribute to the construction sector's performance. Tender for the largest package, the tunnel works, worth RM8 billion will close by this month and the award is expected to be finalised by middle of this year. In addition, government funded rural infrastructure development projects, the KLIA 2 project, the Kuala Lumpur International Financial District, and development of he government's Sungai Buloh rubber land, and the Sungai Besi Kuala Lumpur Air Base will provide momentum to the sector, he added. RAM Holdings Bhd group chief economist Yeah Kim Leng said although the Malaysian economy is expected to moderate this year because of the ongoing eurozone debt crisis, the construction industry is expected to remain well supported by continuing infrastructure-related and property development projects. "Key pillars will continue to be construction projects earmarked under the five development corridors and the 12 National Key Economic Areas (NKEA), especially the various transportation infrastructure and property-related mega projects planned under the Greater Kuala Lumpur NKEA," he said. Yeah said the commencement of the mega MRT project and extension of light-rail transit (LRT) systems together with major investments in the oil and gas sector by Petronas, the national petroleum company, in Peninsular Malaysia, Sabah and Sarawak, are expected to boost construction order books. Entry point projects such as the River of Life project and other iconic projects planned under the Greater Kuala Lumpur NKEA as well as large infrastructure and utilities projects such as the Gemas-Johor Baru electrified double-tracking project are expected to sustain the country's construction activities. "Start-ups of affordable housing projects under the aegis of the government, continuing medium and high-end housing construction as well as commercial property development projects in the nation's capital as well as in other major cities are anticipated to lend support to the moderately strong pace of construction industry growth anticipated this year," he added. Apart from the Gemas-Johor Baru double tracking rail project, other new projects that will kick off this year include several highway projects to be implemented under the Second Rolling Plan (RP2). Among the projects are the Lebuhraya Pantai Timur Jabor-Kuala Terengganu, Lebuhraya Pantai Barat Banting-Taiping, Lebuhraya Segamat-Tangkak and Lebuhraya Central Spine as well as the construction of Kota Marudu-Ranau road. The RP2 is the government initiative under the 10th Malaysian Plan (10MP) to boost investment with an allocation of RM98.4 billion for 2012 and 2013. According to Yeah, a further RM978 million would be allocated to accelerate the development in five regional corridors this year. Among the projects to be implemented are the construction of Johor Baru-Nusa Jaya coastal highway in Iskandar, Johor, heritage tourism development in Taiping in the Northern Corridor, agropolitan scheme in Besut in the East Coast Economic Region, palm oil industrial cluster project in Lahad Datu in Sabah Development Corridor, and Samalaju water supply in the Sarawak Corridor of Renewable Energy. In the 10MP, the government allocated RM20 billion under the public-private partnerships (PPP) Facilitation Fund that provides a tipping point to assist the private sector develop projects with strategic value. Of this total, RM18 billion is for high-impact projects, while the remaining RM2 billion is for projects involving bumiputera entrepreneurs. This year, the government will allocate RM2.5 billion under the fund and an estimated RM300 million is for bumiputera entrepreneurs. Rajan noted that the private sector will likely play a significant role in construction growth in 2012. "Furthermore, the government has been emphasising private participation to drive the economic transformation agenda," he added. A total of 52 projects worth RM62.7 billion have been identified under the new PPP initiative. The PPP concept would include leases, joint ventures and sale of government land for development, and the normal build-operate-transfer mode. Project bankability, he said, depends largely on the PPP terms as the private sector has to finance the construction or development and take on the project risks. Among these PPP projects are seven tolled highways worth RM19 billion, comprising the West Coast Expressway, Guthrie Damansara Expressway, Sungai Juru Expressway and Paroi-Senawang-KLIA Expressway. Also included are two coal electricity generating plants (RM7 billion) and 1,335 hectares of development in Sungai Buloh (RM10 billion). However, while the government is banking on the momentum of private investment to enhance the economy in 2012, Rajan said, foreign direct investment (FDI) inflows may be susceptible to the challenging global economic conditions. Yeah, meanwhile, said that given the one to two years gestation period for FDI projects, the strong pickup in inflows recorded over 2010 and 2011 will translate into start-up of construction activities this year, especially for greenfield projects involving construction of industrial buildings and facilities. "For 2012, locally owned corporations such as UDA Holdings Bhd and Gamuda-MMC consortium are more likely to be the ones undertaking the major projects," he added.